Pravastatin Sodium with NDC 70518-1902 is a a human prescription drug product labeled by Remedyrepack Inc.. The generic name of Pravastatin Sodium is pravastatin sodium. The product's dosage form is tablet and is administered via oral form. FDA Application Number: ANDA207068 What is the FDA Application Number? In hypercholesterolemic patients without clinically evident coronary heart disease (CHD), pravastatin sodium tablets are indicated to:reduce the risk of myocardial infarction (MI).reduce the risk of undergoing myocardial revascularization procedures.reduce the risk of cardiovascular mortality with no increase in death from non-cardiovascular causes.In patients with clinically evident CHD, pravastatin sodium tablets are indicated to:reduce the risk of total mortality by reducing coronary death.reduce the risk of MI.reduce the risk of undergoing myocardial revascularization procedures.reduce the risk of stroke and stroke/transient ischemic attack (TIA).slow the progression of coronary atherosclerosis. Pravastatin sodium tablets are indicated:as an adjunct to diet to reduce elevated total cholesterol (Total-C), low-density lipoprotein cholesterol (LDL-C), apolipoprotein B (ApoB), and triglyceride (TG) levels and to increase high-density lipoprotein cholesterol (HDL-C) in patients with primary hypercholesterolemia and mixed dyslipidemia (Fredrickson Types IIa and IIb). There is a positive family history of premature cardiovascular disease (CVD) ortwo or more other CVD risk factors are present in the patient. Fredrickson Types I and V). The recommended dose is 20 mg once daily in children 8 to 13 years of age. Doses greater than 20 mg have not been studied in this patient population. mg tablets: Yellow coloured, mottled, rounded rectangular shaped, biconvex, uncoated tablets, debossed ‘PB’ on one side and ‘2’ on other side. mg tablets: Light Green coloured, mottled, rounded rectangular shaped, biconvex, uncoated tablets, debossed ‘PB’ on one side and ‘8’ on other side. Adverse Reactions (6)]. Myopathy, defined as muscle aching or muscle weakness in conjunction with increases in creatine phosphokinase (CPK) values to greater than 10 times the ULN, was rare (<0.1%) in pravastatin clinical trials. Myopathy should be considered in any patient with diffuse myalgias, muscle tenderness or weakness, and/or marked elevation of CPK. Predisposing factors include advanced age (≥65), uncontrolled hypothyroidism, and renal impairment. There have been rare reports of immune-mediated necrotizing myopathy (IMNM), an autoimmune myopathy, associated with statin use. IMNM is characterized by: proximal muscle weakness and elevated serum CPK, which persist despite discontinuation of statin treatment; muscle biopsy showing necrotizing myopathy without significant inflammation and improvement with immunosuppressive agents.All patients should be advised to promptly report to their physician unexplained muscle pain, tenderness, or weakness, particularly if accompanied by malaise or fever or if muscle signs and symptoms persist after discontinuing pravastatin sodium tablets.Pravastatin therapy should be discontinued if markedly elevated CPK levels occur or myopathy is diagnosed or suspected. Pravastatin therapy should also be temporarily withheld in any patient experiencing an acute or serious condition predisposing to the development of renal failure secondary to rhabdomyolysis, e.g., sepsis; hypotension; major surgery; trauma; severe metabolic, endocrine, or electrolyte disorders; or uncontrolled epilepsy.The risk of myopathy during treatment with statins is increased with concurrent therapy with either erythromycin, cyclosporine, niacin, or fibrates. However, neither myopathy nor significant increases in CPK levels have been observed in 3 reports involving a total of 100 post-transplant patients (24 renal and 76 cardiac) treated for up to 2 years concurrently with pravastatin 10 to 40 mg and cyclosporine. Some of these patients also received other concomitant immunosuppressive therapies. Further, in clinical trials involving small numbers of patients who were treated concurrently with pravastatin and niacin, there were no reports of myopathy. Also, myopathy was not reported in a trial of combination pravastatin (40 mg/day) and gemfibrozil (1200 mg/day), although 4 of 75 patients on the combination showed marked CPK elevations versus 1 of 73 patients receiving placebo. There was a trend toward more frequent CPK elevations and patient withdrawals due to musculoskeletal symptoms in the group receiving combined treatment as compared with the groups receiving placebo, gemfibrozil, or pravastatin monotherapy. Clinical Studies (14)]. In an analysis of serum transaminase values (ALT, AST), incidences of marked abnormalities were compared between the pravastatin and placebo treatment groups; a marked abnormality was defined as a post-treatment test value greater than 3 times the ULN for subjects with pretreatment values less than or equal to the ULN, or 4 times the pretreatment value for subjects with pretreatment values greater than the ULN but less than 1.5 times the ULN. Marked abnormalities of ALT or AST occurred with similar low frequency (≤1.2%) in both treatment groups. Overall, clinical trial experience showed that liver function test abnormalities observed during pravastatin therapy were usually asymptomatic, not associated with cholestasis, and did not appear to be related to treatment duration. In a 320-patient placebo-controlled clinical trial, subjects with chronic (>6 months) stable liver disease, due primarily to hepatitis C or non-alcoholic fatty liver disease, were treated with 80 mg pravastatin or placebo for up to 9 months. The primary safety endpoint was the proportion of subjects with at least one ALT ≥2 times the ULN for those with normal ALT (≤ ULN) at baseline or a doubling of the baseline ALT for those with elevated ALT (> ULN) at baseline. By Week 36, 12 out of 160 (7.5%) subjects treated with pravastatin met the prespecified safety ALT endpoint compared to 20 out of 160 (12.5%) subjects receiving placebo. Conclusions regarding liver safety are limited since the study was not large enough to establish similarity between groups (with 95% confidence) in the rates of ALT elevation. Contraindications (4.2)]. Caution should be exercised when pravastatin is administered to patients who have a recent (<6 months) history of liver disease, have signs that may suggest liver disease (e.g., unexplained aminotransferase elevations, jaundice), or are heavy users of alcohol. 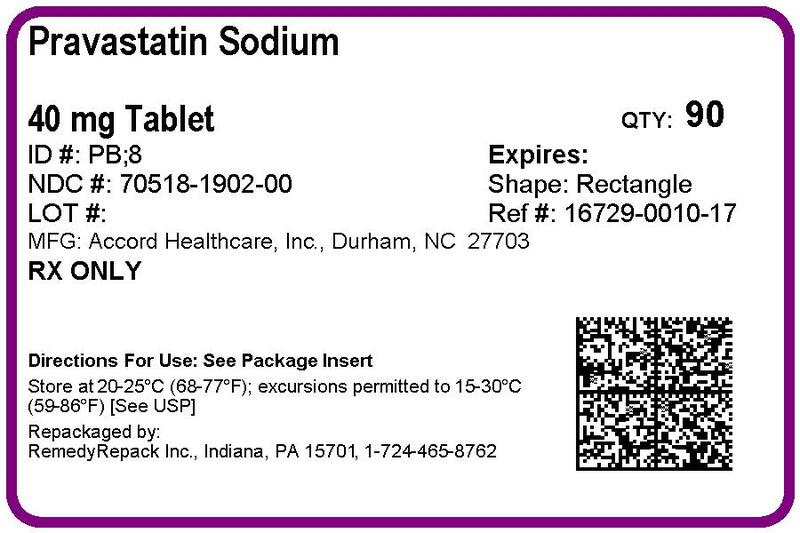 There have been rare postmarketing reports of fatal and non-fatal hepatic failure in patients taking statins, including pravastatin. If serious liver injury with clinical symptoms and/or hyperbilirubinemia or jaundice occurs during treatment with pravastatin sodium tablets, promptly interrupt therapy. If an alternate etiology is not found do not restart pravastatin sodium tablets. The safety and tolerability of pravastatin sodium tablets at a dose of 80 mg in 2 controlled trials with a mean exposure of 8.6 months was similar to that of pravastatin sodium tablets at lower doses except that 4 out of 464 patients taking 80 mg of pravastatin had a single elevation of CK >10 times ULN compared to 0 out of 115 patients taking 40 mg of pravastatin. In addition to the events listed above in the long-term trials table, events of probable, possible, or uncertain relationship to study drug that occurred in <2.0% of pravastatin-treated patients in the long-term trials included the following:Dermatologic: scalp hair abnormality (including alopecia), urticaria. Abnormalities: liver function test abnormalities, thyroid function abnormalities. Warnings and Precautions (5.1, 5.2)]. 2 of approximately 100 prospectively followed pregnancies in women exposed to simvastatin or lovastatin, the incidences of congenital anomalies, spontaneous abortions, and fetal deaths/stillbirths did not exceed what would be expected in the general population. The number of cases is adequate to exclude a ≥3- to 4-fold increase in congenital anomalies over the background incidence. In 89% of the prospectively followed pregnancies, drug treatment was initiated prior to pregnancy and was discontinued at some point in the first trimester when pregnancy was identified.
. Based on one lactation study in published literature, pravastatin is present in human milk. There is no available information on the effects of the drug on the breastfed infant or the effects of the drug on milk production. Because of the potential for serious adverse reactions in a breastfed infant, advise patients that breastfeeding is not recommended during treatment with pravastatin sodium tablets.
. Advise females of reproductive potential to use effective contraception during treatment with pravastatin sodium tablets. and practically insoluble in acetone, acetonitrile, chloroform, and ether.Pravastatin sodium tablets, USP are available for oral administration as 10 mg, 20 mg, 40 mg, and 80 mg tablets. also contains ferric oxide red, the 20 mg and 80 mg tablets also contain ferric oxide yellow, and the 40 mg tablet also contains D & C yellow No. 10 aluminum lake & FD & C blue No. l aluminum lake. Absorption: Pravastatin sodium tablets are administered orally in the active form. 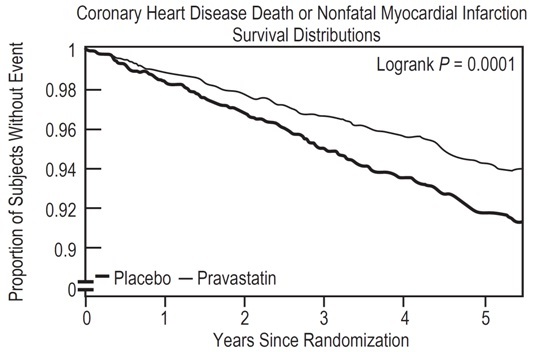 In studies in man, peak plasma pravastatin concentrations occurred 1 to 1.5 hours upon oral administration. Based on urinary recovery of total radiolabeled drug, the average oral absorption of pravastatin is 34% and absolute bioavailability is 17%. While the presence of food in the gastrointestinal tract reduces systemic bioavailability, the lipid-lowering effects of the drug are similar whether taken with or 1 hour prior to meals. Distribution: Approximately 50% of the circulating drug is bound to plasma proteins. Metabolism: The major biotransformation pathways for pravastatin are: (a) isomerization to 6-epi pravastatin and the 3α-hydroxyisomer of pravastatin (SQ 31,906) and (b) enzymatic ring hydroxylation to SQ 31,945. 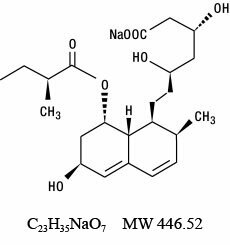 The 3α-hydroxyisomeric metabolite (SQ 31,906) has 1/10 to 1/40 the HMG-CoA reductase inhibitory activity of the parent compound. Pravastatin undergoes extensive first-pass extraction in the liver (extraction ratio 0.66). Excretion: Approximately 20% of a radiolabeled oral dose is excreted in urine and 70% in the feces. After intravenous administration of radiolabeled pravastatin to normal volunteers, approximately 47% of total body clearance was via renal excretion and 53% by non-renal routes (i.e., biliary excretion and biotransformation). ½ for the inactive enzymatic ring hydroxylation metabolite (SQ 31,945). evidence of mutagenicity in either a dominant lethal test in mice or a micronucleus test in mice. CNS vascular lesions, characterized by perivascular hemorrhage and edema and mononuclear cell infiltration of perivascular spaces, were seen in dogs treated with pravastatin at a dose of 25 mg/kg/day. These effects in dogs were observed at approximately 59 times the HD of 80 mg/day, based on AUC. Similar CNS vascular lesions have been observed with several other drugs in this class.A chemically similar drug in this class produced optic nerve degeneration (Wallerian degeneration of retinogeniculate fibers) in clinically normal dogs in a dose-dependent fashion starting at 60 mg/kg/day, a dose that produced mean plasma drug levels about 30 times higher than the mean drug level in humans taking the highest recommended dose (as measured by total enzyme inhibitory activity). This same drug also produced vestibulocochlear Wallerian-like degeneration and retinal ganglion cell chromatolysis in dogs treated for 14 weeks at 180 mg/kg/day, a dose which resulted in a mean plasma drug level similar to that seen with the 60 mg/kg/day dose.When administered to juvenile rats (postnatal days [PND] 4 through 80 at 5 to 45 mg/kg/day), no drug related changes were observed at 5 mg/kg/day. At 15 and 45 mg/kg/day, altered body-weight gain was observed during the dosing and 52-day recovery periods as well as slight thinning of the corpus callosum at the end of the recovery period. This finding was not evident in rats examined at the completion of the dosing period and was not associated with any inflammatory or degenerative changes in the brain. The biological relevance of the corpus callosum finding is uncertain due to the absence of any other microscopic changes in the brain or peripheral nervous tissue and because it occurred at the end of the recovery period. Neurobehavioral changes (enhanced acoustic startle responses and increased errors in water-maze learning) combined with evidence of generalized toxicity were noted at 45 mg/kg/day during the later part of the recovery period. Serum pravastatin levels at 15 mg/kg/day are approximately ≥1 times (AUC) the maximum pediatric dose of 40 mg. No thinning of the corpus callosum was observed in rats dosed with pravastatin (≥250 mg/kg/day) beginning PND 35 for 3 months suggesting increased sensitivity in younger rats. PND 35 in a rat is approximately equivalent to an 8- to 12-year-old human child. Juvenile male rats given 90 times (AUC) the 40 mg dose had decreased fertility (20%) with sperm abnormalities compared to controls. previous MI, and with LDL-C levels between 156 to 254 mg/dL (4 to 6.7 mmol/L). (−27.6, 12.5), and 6.7 (−2.1, 15.6), respectively. and significant throughout the entire range of baseline LDL cholesterol levels. vs 51 patients, p=0.009) and coronary angiography by 31% (128 vs 90, p=0.007). and there was no increase in death from non-cardiovascular causes. for unstable angina pectoris (3260 patients) in the preceding 3 to 36 months. of patients were receiving aspirin and 82% were taking antihypertensive medications. risk reduction due to treatment with pravastatin sodium tablets was consistent in both sexes. seen in the pravastatin treatment group (p=0.02). and hypercholesterolemia (baseline total cholesterol range: 160 to 310 mg/dL). evaluated at baseline and at 2 years in 653 patients (323 treated with pravastatin). the rate of nonfatal MI. analysis of 2 multicenter, double-blind, placebo-controlled studies. 20 or 24 g per day) had reductions equal to or greater than 50% in LDL-C.
levels (which are themselves of uncertain clinical significance). parent with either a clinical or molecular diagnosis of familial hypercholesterolemia. in the 2 age groups was similar. at p≤0.0001 when compared with placebo. - An integrated approach to mechanisms and disorders. 1967;276: 34-44, 94-103, 148-156, 215-225, 273-281. Surveillance of lovastatin and simvastatin exposure during pregnancy. With pravastatin in men with hypercholesterolemia. Pitt B, Mancini GBJ, Ellis SG, et al, for the PLAC I Investigators. Reduction in atherosclerosis progression and clinical events. In symptomatic man with normal to moderately elevated serum cholesterol levels. Trial with carotid atherosclerosis outcome (PLAC II). They are supplied in bottles containing desiccant canister as follows. NDC NumberSize16729-008-15Bottle of 90 tablets16729-008-16Bottle of 500 tablets16729-008-17Bottle of 1000 tablets20 mg tablets:Yellow coloured, mottled, rounded rectangular shaped, biconvex, uncoated tablets, debossed ‘PB’ on one side and ‘2’ on other side. Store at 25°C (77°F); excursions permitted to 15°C to 30°C (59°F to 86°F) [see USP Controlled Room Temperature]. Keep tightly closed (protect from moisture). Protect from light.